The Bluebell Railway is a 11 mi (17.7 km) heritage line almost entirely in West Sussex in England, except for Sheffield Park which is in East Sussex. It is managed by the Bluebell Railway Preservation Society. 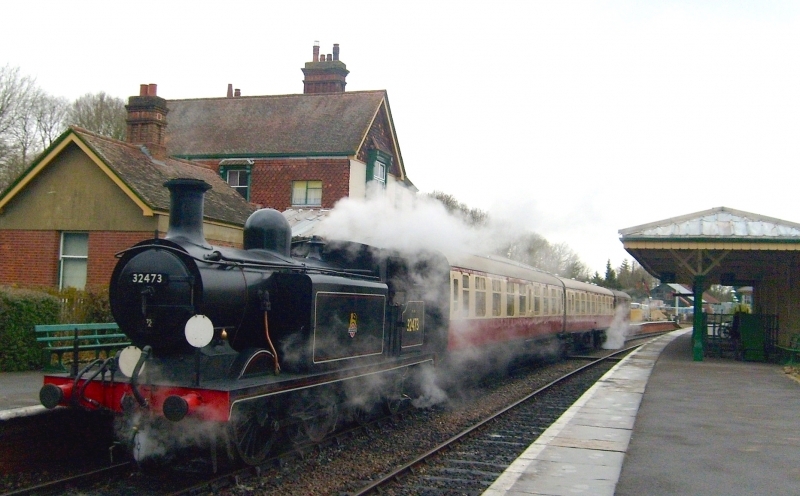 It uses steam trains which operate between Sheffield Park and East Grinstead, with intermediate stations at Horsted Keynes and Kingscote. The first preserved standard gauge steam-operated passenger railway in the world to operate a public service, the society ran its first train on 7 August 1960, less than three years after the line from East Grinstead to Lewes had been closed by British Railways. On 23 March 2013, the Bluebell Railway started to run through to its new East Grinstead terminus station. At East Grinstead there is a connection to the national rail network, the first connection of the Bluebell Railway to the national network in 50 years, since the Horsted Keynes – Haywards Heath line closed in 1963. Today the railway is managed and run largely by volunteers. Having preserved a number of steam locomotives even before they stopped running on British mainline railways in 1968, today it has over 30 steam locomotives - the largest collection in the UK after the National Railway Museum. The Bluebell also has almost 150 carriages and wagons, most of them pre-1939. Please give us your overall rating for Bluebell Railway.